Henry, Paul, Scott and Jim are round for a right old knees up for Harold's stag do - only it's clearly not as fun as they had hoped it would be. Scott thinks he should get home as Charlene will hit the roof if he's late back and Jim admits that Beverly is much the same. But Harold is adamant that they can't leave - David hasn't arrived yet! So Jim and the boys admit defeat, just in time for there to be a knock at the door and David to arrive. 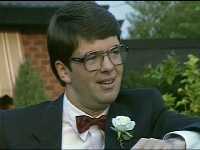 A young smartly-dressed gentleman with very similar glasses to Harold is presented, greeting them with a "How do you do?". Scott can barely keep a straight face. The next day and Mrs Mangel is over at Des and Mike's place with a rather large trunk for Eileen. Des is worried that his mum will get charged a fortune in excess baggage but Mrs Mangel is having none of it - she was entrusted with packing for the trip and thus nothing is being left behind. And to really annoy them she invites herself in for a cup of tea. Des thanks Mrs Mangel for arranging for Eileen to go on the trip and promises not to forget the suitcase. Harold is disappointed about Kerry's non appearance at the wedding. David ensures him that Kerry will come to appreciate his high-expectations in time, as he has. But then Harold has something else to worry about - while he and David are in full wedding garb at 8.30 am Jane isn't even dressed! David asks, none to subtly, to be introduced to her and comments that her outfit is very fetching (even though it isn't for the wedding). Mrs Mangel comes in and starts dusting, to Harold's incredulity. But it's all in hand, according to Nell, who agitates David's allergies by banging two pillows together next to him. David 'retires' to his room in order to cough and splutter more freely there. Jane can't help but laugh as an annoyed Harold dashes off. Scott is annoying Charlene and everyone is a little keyed up. Madge decides they should all take five . She wants to know what went on at the Buck's Party and is glad to hear that the group's creativity had gone awol. Scott mentions meeting Harold's son, and tells them that, in contrast to Charlene's prediction, he's good looking and pretty wild! Henry agrees - he's pretty damn dangerous! Harold's rehearsing a few words for later. Unbeknownst to him Jane and Mrs Mangel look on. Jane thinks that it's beautiful. 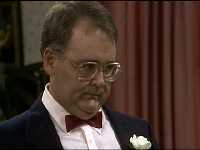 Mrs Mangel thinks he's too solemn and if he's having second thoughts.. Harold can't believe she would say such a thing! But Mrs Mangel thinks that if marrying 'that Ramsay woman' fills him with such glee, then maybe he's getting cold feet. Harold tells Mrs Mangel that he's put up with her comments in the past but not today - he loves Madge 'desperately, passionately, and irrevocably' with every fibre of his being. HAROLD: So, unless you apologise this very split second, I shall have great pleasure in instructing my bride not to very gently lob the bouquet in your general direction - but to make sure it's impounded in your left ear!! That doesn't go down too well and Jane says she's sure Mrs Mangel didn't mean it. Nell apologises for offending him and makes her exit. Harold laughs as Jane tries to apologise for her gran and tells her that he was anxious earlier on but there's no need to be! Henry drives up in the bridal car. David comes over. DAVID: You realise this a milestone for us, Henry. Once dad and your mum tie the proverbial, that makes us - well, almost brothers. HENRY (looking a bit scared): Wow. DAVID: I've never had a brother before, Henry - I hope we can be friends. Henry doesn't think that he's too bad a bloke and David feels the same about him. David talks about Henry being in the gardening trade - making a joke about being at the 'grass roots' of everything before laughing a lot. It's going to be a very long day. Madge has been transformed into a bride and the emotional music comes on. Charlene thinks she looks great and hopes Henry does a good job of giving her away. Madge starts to cry and Charlene thinks that if she doesn't stop that she'll be bawling all the way to the church. But Madge is still tearful, musing that all her kids have grown up. Charlene, optimistically, reminds her that this is the time for her to make a life for herself again. A tooting car horn provides their cue to go. Harold starts to protest but she tells him he's kept Madge hanging on for long enough. Harold tells her that her point has been registered and Edna thinks he'll do her for a son in law. The car pulls up and Henry opens the door for his mother before escorting her into the church. Harold smiles as he catches sight of them from the altar. David does the same, looking a little bemused at the same time. Mrs Mangel, playing the organ, is trying to have a butchers too. She stuffs up some notes to Harold's obvious dismay. After finally reaching the congregation (the Church seems very empty - everyone's crammed in near the front) Madge joins Harold and they stand at the altar. Cue some nice cheesy music whilst the minister welcomes them all and talks about the spiritual union of marriage with close-ups on Scott and Charlene and then Des. After the "I dos" and a nice fade Harold slips a ring on Madge's finger. HAROLD WAYNE BISHOP: With this ring I wed you; with my body I worship you; with all that I am and all that I have, I honour you. With this Harold Wayne Bishop and Madge Mary Ramsay are husband and wife. They kiss and there is clapping from the congregation. Both look a little embarrassed but pleased at the same time. Harold and Madge emerge and rice is tossed over them. We're treated to a nice montage of their photos being taken with music playing over the top - even Mrs Mangel gets her photo taken with the minister! Madge and Harold get into the car and wave to their friends as it pulls away. At the reception a very young Todd and Katie pick up some food. Scott and Charlene are going to Queensland to help Edna with Dan, once he's out of the hospital. Scott's looking forward to hitting the beaches! Paul goes to shake Harold's hand but Harold won't be shaking it today - he won't be letting go of Madge's hand all day!! (*lol*) David appears. DAVID: Welcome to the family.Mother. Henry proposes a toast to the happy couple. Madge starts her speech but Des can't listen to it and leaves via the back door. Mike spots him go. Mike finds Des looking at his and Daphne's wedding photo, crying. Mike understands that he couldn't hang around. Des was doing okay but then he suddenly thought of Daphne.Mike thinks he was doing better then most would. He suggests they get back to the reception and Des turns over the photo and stands up. Mike and Des have been missing a speech from David (they'll be kicking themselves!). DAVID:.And so it really is true that you can't pick and choose your own family. (looks to Madge and Harold) But, by golly, if I could, I know where I'd start looking! Jim manages to cut in and persuade him to look through the telegrams before he launches off again. Charlene presents them with their wedding present, which the whole of Ramsay Street pitched in to help buy. They've bought them a honeymoon as Madge and Harold didn't want to splash out - a weekend in the same guesthouse in the Green Valley. Madge wants to go and change but Harold wants her to look like that forever. She tosses the bouquet and Sally Wells catches it. Madge and Harold kiss with a soundtrack of cheesy music and the kids have a good old laugh at them again before the happy couple turn around and join in..